Cement dust poses an occupational hazard causing respiratory (owing to its inhalation), dermatological, ocular and hematological problems. The purpose of the current study was to evaluate the effect of occupational exposure of cement dust on hematological parameters in construction workers. Apparently healthy sixty five (65) adult male construction workers aged 25-50 years participated in this study. Three (3.0) ml venous blood samples were collected from each participant for hematological analysis at two different time points, one at 8 AM and second at 4 PM at the end of work shift. Differences in means and test of significance were calculated using paired Student’s t-test. The results revealed that post shift samples showed statistically significant increase (p<0.05) in mean total leukocyte count (TLC), lymphocyte %, monocyte % and eosinophil % and statistically significant decrease (p<0.05) in mean hemoglobin, red blood cell (RBC) count, packed cell volume (PCV) and platelet count. The present study confirms that hematological parameters are significantly effected in construction workers which may be attributed to the work atmosphere predominated with cement dust. In today’s world, the progress and advancement of a country is measured in terms of its industrialization. The industrialization and urbanization has direct effect on the environment. The most prominent visual features of urbanization are buildings and infrastructure . Activities such as manufacturing, production, processing, supply and utilization not only exhaust the natural resources but also add pressure to the environment by amassing wastes [2,3]. Construction of buildings, roads and other amenities are the major activities in urbanization. Chief hazardous constituent in building material is the cement dust, actively involved in causing air pollution and it poses an occupational hazard among construction workers. Cement is made from limestone, laterites, clay and gypsum; and its composition includes, calcium oxide (lime), aluminium trioxide, silicon dioxide (silica), iron oxide and other impurities . These pollutants have been implicated in many diseases including respiratory abnormalities, genetic disorders, hematological complications, organs and systems failure, vision problems, brain damage and teratogenic effect . Cement dust can cause ill health by inhalation, skin contact or eye contact and the extent of damage depend on the duration of exposure, level of exposure and individual sensitivity . Lime is an alkaline material and corrodes biological tissues; silica is a skin abrasive and also damages the lungs; and chromium causes allergic reactions . Many of the studies [3,4,6,8,9,10] done previously demonstrated the effect of cement dust on respiratory system. These studies found out considerable decline in the lung function parameters due to cement dust inhalation. Studies conducted by Meo , Emmanuel et al  and Stern et al  reported that cement dust enters systemic circulation and reaches different organs of the body effecting tissues like heart, liver, spleen, bone, hair, etc. ultimately effecting microstructure and physiological performance. The findings of recent studies conducted by Jude et al  and Mojiminiyi et al  suggests that cement dust causes hematological and cytogenic damage among cement workers. Exposure to cement also causes a significant reduction in life expectancy of the average population of workers by a month or more . The human hematopoietic system is exceptionally sensitive to some environmental influences because of rapid synthesis and destruction of cells with consequent heavy metabolic demand . Hematological parameters and white blood cell differentials are sensitive index and may be useful as an indirect diagnostic or prognostic tool in assessing the toxicity of cement dust. Many previous studies focussed on correlation between pulmonary functions and cement dust in construction workers but few studies are available to demonstrate the effect of cement dust on hematological system. The present study was designed with an aim to explore the acute effect of cement dust on hematological parameters in construction workers. This cross-sectional (Before-After design) study was conducted in the department of Physiology of this institution after approval from Institutional Review Board (Reference No: 2016/15/008). Sixty five (65) apparently healthy male volunteers employed in construction work were recruited after taking written consent. There age ranged from 25 to 50 years. Subjects with history of hypertension, diabetes mellitus, tuberculosis and other chronic diseases were excluded from the study. Data were collected on general demographic profile, smoking, alcohol consumption, medical/clinical history, history of past diseases and clinical signs. The weight and height were noted. The blood pressure (BP) was recorded with sphygmomanometer (Diamond, India). Three millilitre (3.0 ml) of venous blood was drawn and collected in dipotassium salt of Ethylenediamine tetra acetic acid (EDTA) vacutainers. Blood samples were collected from each participant at two different time points; one sample was collected at 8 AM before the work shift and second at 4 PM at the end of work shift. These samples were transported to the laboratory within half hour then centrifuged for 30 minutes before analyzing it by automated machine (Mindray BC2800, Shenzhen Mindray Bio-Medical Electronics Co., China) for various hematological parameters such as hemoglobin concentration (Hb), red blood cell count (RBC), total leukocyte count (TLC), differential leukocyte count (DLC), platelets (PLT), packed cell volume (PCV), blood cell indices like mean corpuscular volume (MCV), mean corpuscular hemoglobin (MCH) and mean corpuscular hemoglobin concentration (MCHC). Data is expressed as Mean±SD. Test of significance was calculated using paired Student’s t-test. Statistical analysis was performed using SPSS (version 17.0) package. p<0.05 was considered significant. A summary of demographic data is presented in Table 1. Table 2 reveals that RBC count, Hb content, PCV were significantly decreased after work shift but MCV and MCH did not show statistically significant change. There was a statistically significant increase in TLC after work shift (Fig 1). A statistically significant increase in lymphocyte, eosinophil and monocyte percentage after the shift was noted but the change in neutrophil percent was statistically insignificant (Fig 2). Also there was a significant decrease in platelet count after the shift duration in workers as compared to pre-shift values (Fig 3). This study was conducted to know the acute effects of cement dust exposure on blood cells. In the present study, it was observed that the red cell count, hemoglobin content and packed cell volume were significantly lower after work shift but MCV and MCH were uneffected. These results are in agreement with the findings of Ashwini et al , Jude et al  and Mojiminiyi et al  wherein they found significant lowering in the red cell count, packed cell volume and hemoglobin. This may be due to effect of components of cement dust on hemopoetic system. Naik et al reported no change in Hb levels . A case-control study done in India reported significantly reduced Hb, PCV and MCV whereas MCHC increased significantly . Okonkwo et al reported no change in Hb and PCV . There was no correlation of hematological parameters with the years of exposure but the prevalence of anemia was higher in construction workers [18,19]. There was a significant increase in TLC after work shift and confirms the findings of Ashwini et al  and Naik et al . The agranulocyte percentage (lymphocyte and monocyte) increased significantly after the shift. Mandal et al  found no change in monocyte percentage. Among the granulocytes, an increase in eosinophil count was noted. This could be an indication of hypersensitivity reaction of the body to cement dust. These results are similar to the findings of Jude et al  Mojiminiyi et al  and Mandal et al . There was an insignificant decrease in neurophils after exposure in our study which is in contradiction to the findings of Fell et al  who showed significant increase. Okonkwo et al reported lower lymphocytes and TLC in the exposed workers . Also we found significant decrease in the platelet count after work shift. This is in conformity with the results of Jude et al13 and Okonkwo et al  who reported a significant fall in platelets in exposed as compared to control group whereas Mojiminiyi et al  and Ashwini et al  reported increase in platelets. Mandal et al also reported decrease in platelets but the change was statistically not significant . The lowering of packed cell volume, red cell count, hemoglobin content and platelet count could suggest that cement dust has deleterious effect on hematological system. The raised total white blood cell count suggests a reaction to irritant cement dust lodged in the lungs . Exercise is an important physiological factor which increases total WBCs and neutrophils particularly. Construction workers are engaged in heavy physical work which is akin to severe exercise, the changes in the WBCs may be, in part, due to muscular activity. Since we have given adequate rest post work shift before blood sample is collected, effect of muscular activity on blood parameters was ignored. No biochemical or toxicological evaluation of presence of constituents of cement dust in blood was done. Present study has shown that occupational exposure to cement dust has a significant effect on hematological parameters. In individuals working in places containing cement dust in the environment, post work shift blood samples in comparison to pre shift samples showed a significant increase in TLC and WBC differentials like lymphocytes, monocytes and eosinophils. Parameters pertaining to RBC like Hb, RBC count and PCV significantly decreased, so also there was a noted decrease in platelet count. Therefore the present study indicates that the hematological parameters are acutely effected on exposure to cement dust. The present study was a cross sectional study of cement workers taken at one point of time. The results will be more corroborative if the study period and the study population was increased or a longitudinal study can be planned which will give a real risk estimate. 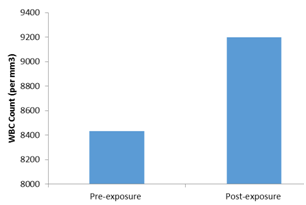 This study highlights that the workers occupationally exposed to cement dust be provided with appropriate personal protective equipment to reduce the effect of exposure. Regular medical examinations should incorporate the evaluation of hematological profile. Complete blood picture (CBP) is a simple and cost effective tool as a screening test of haematological parameters. These protective measures can decrease the effect of occupational hazards of cement dust while preserving the health of construction workers. Thus the workers exposed to the cement dust have tendency to develop anemia of varying degree of severity and periodic assessment through complete blood picture may help in early diagnosis and treatment of anemia. World Resources Institute, United Nations Environment Programme, United Nations Development Programme, World Bank. World Resourses 1998-99. Environmental change and human health. World Resources Institute, May 1998. Available from http://www.wri.org/publication/world-resources-1998-99. Amodu AE, Egwuogu CP. Elemental characterization of Obajana Limestone deposit using energy dispersive x-ray fluorescence (XRF) technique. J Appl Sci Environ. 2014:65-68. Emmanuel TF, Ibiam UA, Okaka AN, Alabi OJ. Effects of cement dust on the hematological parameters in Obajana cement factory workers. Eur Sci J. 2015; 11(27):256-66. Jude CA, Sasikala K, Kumar RA, Sudha S, Raichel J. Haematological and cytogenetic studies in workers occupationally exposed to cement dust. Int J Hum Genet. 2002; 2(2):95-9. Neboh EE, Ufelle SA, Achukwu PU, Udet VC. Cement dust exposure affects haematological parameters in cement loaders in Enugu Metropolis, South-East Nigeria. J Exp Res. 2015; 3(1):1-4. Ashwini S, Swathi K, Saheb SH. Effects of cement dust on hematological and liver function tests parameters. Int J Curr Pharm Clin Res. 2016; 6(2):70-3. 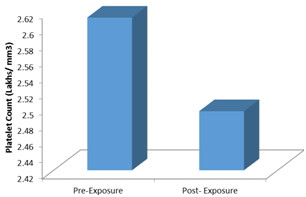 Mandal A, Suva P. Hematological changes among construction workers exposed to cement dust in West Bengal, India. Prog Health Sci. 2014; 4(1):88-94.